On Dec. 1, 2005, after five months of renovation work, Lotte Hotel World begins a new chapter in its history with the opening of "Mega CC," a Premium Brewery Pub, to complement the Windsor Bar and Charlotte Banquet Room. Mega CC is an entertaining place for people on the go, and for those who enjoy the informality of a Brew Pub environment. Mega CC offers a "mega-ton" of fun and joy for beer-lovers. The ambient appeal of Mega CC can be characterized by five categories; "Mega Space," "Mega Beer," "Mega Dishes," "Mega Service," and "Mega Entertainment." Mega CC targets patrons who pursue authentic tastes in fun, trendy places. Mega CC is the largest brewery pub in Korea, with two-storeys of space equipped with 605 seats and 6 Karaoke rooms. Its dark wooden interior and accessories provide a distinctive German ambiance that is both exotic and cozy. Enrico Gritzner, Mega CC's new German Brew-master, has a Master's Degree from a notable German university and possesses considerable experience in the German brewery pub scene. Mega CC's three draft beers; Weizen, Dunkles, and Pils, harmonize taste, aroma, and color. Weizen, a wheat beer, contains a high amount of Polyphenol, which is known to prevent cancer. Dunkles has a uniquely smooth, sweet taste whilst Pils is known for its bitter taste and frothy head. These brews are for people who truly enjoy real beer. 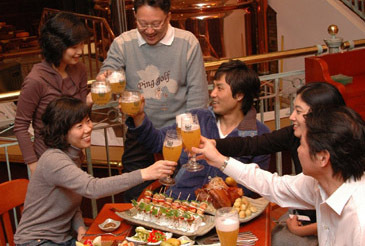 Mega CC presents a range of almost 30 dishes including favorites made of lamb, pork, potatoes, and other ingredients especially suited for beer consumption. Home-made German-style dishes such as Haxen, Munchen Meat Loaf, 3-Color Long Sausages, and potato dishes harmonize perfectly with German style draft beer. Featured menus are the "Giant Menu," "Couples Menu," "Stylish Menu," and "Sampler & Meal." Mega CC will increase guest satisfaction with a concept that includes exceptional service, but unlike other hotel restaurants and bars it does not automatically add the typical 10% Service Charge. Employees are trained not only in general service methods, but also about Bavarian related cooking, style, and service to offer patrons nothing but the best experience. To round out the Brewery Pub ambiance and experience, Mega CC offers the entertainment by 'Rapture,' a 7-voice, South American mixed-vocal ensemble that has performed at the Hyatt, Sheraton, and Shangri-La organizations. Performing a mix of pop and rock music daily, Rapture shows stagecraft and professionalism to delight audiences in an exciting exotic atmosphere. On Dec. 1, 2005 Lotte Hotel World introduces MEGA CC, a Premium Brewery Pub, appointing German Brewmaster Enrico Gritzner. In charge of the entire beer-making process, a brewmaster decides which types of beer a brewery pub makes and sells, and his choices of yeast, malt, and hops distinguish the character of the beer as well as its quality. Naturally these choices should reflect guests' preferences in addition to the brewmaster's own. As this is critical to the success of a brewery pub, the selection of the best brewmaster for each individual brewery pub is essential, which is why brewmaster Gritzner was chosen to help MEGA CC. 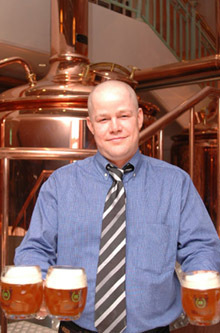 Actively involved with beer-making since the age of 16, Gritzner was educated in traditional and contemporary beer-making techniques and possesses a Master's Degree from Deomens, a notable German College specializing in beer-making. He then spent 12 years honing his skills with Sternquell brewers, one of Germany's outstanding beer-makers. Expressing his dedication to his craft, Gritzner says, "Beer is part of the German lifestyle, and I want to bring our beer-making culture as an expert working in many countries around the world." To achieve his dream at MEGA CC, Gritzner will present beers that perfectly harmonize taste, color, and aroma, such as Weizen, Dunkles, and Pils. Weizen is a wheat beer, which in addition to being delicious and full-bodied, contains a high amount of Polyphenol which is known to prevent cancer. Dunkles has a uniquely smooth, sweet taste and Pils is known for its "bitter" taste and frothy head. Gritzner notes that while "most Korean beers are mild, I plan to make a little bit more strongly flavored, aromatic beers like those found in Germany. I feel that the most important characteristics for great beer are fresh taste and a full foamy head." Brewmaster Gritzner is the perfect person to spearhead the popularity of freshly-made authentic German-style beer in Seoul.